Welcome to Apache Libcloud’s documentation! Apache Libcloud is a Python library which hides differences between different cloud provider APIs and allows you to manage different cloud resources through a unified and easy to use API. 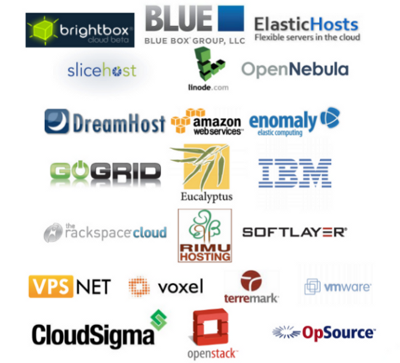 A subset of supported providers in Libcloud. Why are the block storage related management methods located in the compute API? What are the extension methods and arguments? How do I test if provider credentials are valid? I want do add a new provider driver what should I do? I want to add / propose a new API, what should I do? How do I obtain Libcloud version? Unless noted otherwise, all of the examples and code snippets in the documentation are licensed under the Apache 2.0 license. © Copyright 2013, The Apache Software Foundation. Revision 664135b862eae7fb6c395c715db1cd61fa4c2540.